As a Freelance Sound Mixer, I get many calls every year from brand new clients asking me to record sound on their project. Sometimes it’s a very straightforward sit-down interview, or much more complicated commercial with multiple talent and agency clients who need to listen in on my recording to ensure everything is on brand. Am I running around or are we going to be seated? What kind of noise issues will I need to consider? What is the nature of the video? What kind of post production turnaround is expected? Do I need to send a wireless audio feed to camera? Do I need to send timecode to camera? Is this a one person job or do I need to bring on an assistant? 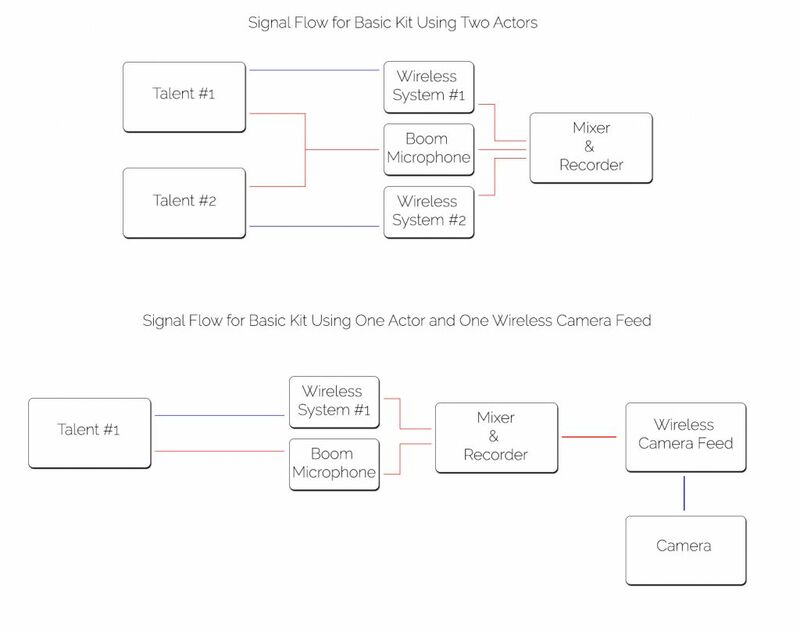 How many wireless lav mics will I need? Are there any uncommon requests I need to accommodate such as a board feed via TRS out? Signal flowchart with a basic kit and basic kit with a single camera link. Diagram courtesy of Eric Carbonara. 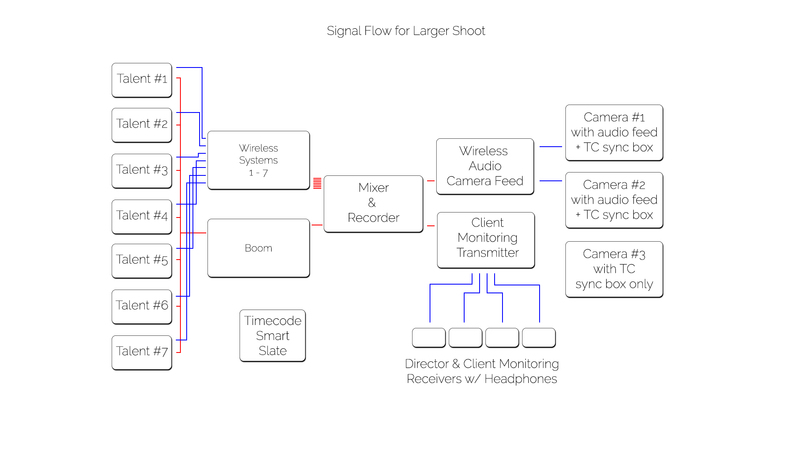 Signal flowchart for a more complex shoot requiring pretty much everything. Diagram courtesy of Eric Carbonara. How many talent are there? What cameras are we using? How can I turn eleven questions into four? Let’s break this down. Is is a simple sit down interview with one talent? I know my basic kit will cover it and I should bring a mic stand, and send my mix to camera if at all possible. Is it a commercial shoot with a lot of dialogue? I need a boom op. STORY – I did a shoot years ago on a sandy beach that necessitated covering all my Nomad recorder’s ports with gaff tape to keep the sand out. Not the most common prep I need to do. Is it a documentary with a single host and interviews on the street? I know slating will be impractical so I need to recommend other methods of syncing sound and picture such as a Camera Link with Time Code. Event footage with a fast turnaround? You need a wireless camera link and time code so the editor doesn’t spend a lot of time syncing picture and sound. Branded content or a commercial? I know my client’s client will want a Wireless Headset to monitor my recording, colloquially Comteks. I recommend them with my gear package. Are we following drivers in a race car where there is no space to put my audio bag? I need my Zaxcom ZMT Wireless Sets with a built in recorder because I know they will drop out of RF range. Right there, I’ve already answered 1, 4, 5, 9. I’ve also partially answered 6, 7, and 11, more on those below. That’s more than half of what I need to know with one question. This one is pretty straightforward. The number of talent on camera at one time tells me how many Wireless Mic Packs you will need. Pretty straightforward, but incredibly important. If there are a lot of talent, say twelve people on camera at a time (not uncommon for Reality), I know I need a second person. That confirms questions 9 and 10. Sony F series or Canon C series? These have full sized XLR ports so if the camera is locked down for an interview, I can send two channels and save the editor a lot of time syncing. If it’s a camera that does not have Time Code IO then I know not to recommend a Sync Box. 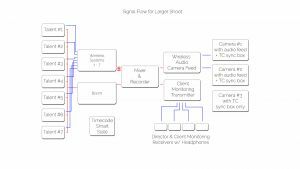 If it is a DSLR or a Mirrorless Camera such as the Sony a7s, audio input is unreliable and Time Code IO is nonexistent, so I need to provide a Clapper Board or some means of giving the editor a clear sync point. The number of cameras also give me a sense of what to expect. Multiple cameras will often make it impossible to find a good position for the boom, so I’ll be dependent on Wireless Mic Packs. Multiple cameras also need clear sync points, usually a Smart Slate or if possible, a Time Code Sync Box such as my Zaxcom ERX’s which also provide a mono guide track. Questions 7 and 8 are locked in. Where we are shooting gives me a sense of what I can expect to deal with in addition to some of the practical prep work such as planning my commute and parking. Ball game? I need to pack very light so I can be super mobile and also need to send a wireless feed. I know there will be a lot of background noise so I choose my mics based on how well that can cut through that. An office during working hours? I know I need to investigate the AC controls in the building. Interviews with random people on the street? I know to expect street noise and that micing up talent will be impractical. If I know there will be an on camera talent, I need to ask about a handheld mic. Question 2 is obviously answered, and I have enough experience to infer the issues I can likely expect for 3. Every project is different, and occasionally something unusual will come up. Having recorded thousands of hours of audio in my career and working with dozens of new clients every year, these four questions will tell me at least ninety percent of what I need to know every single time so I can put together the best solution for my client’s project.